2014 AGU Fall Meeting | Assessment of coastal flood risk in a changing climate along the northern Gulf of Mexico – Matthew V. Bilskie, Ph.D.
M.V. Bilskie, S.C. Hagen, D.L. Passeri, K. Alizad, “Assessment of coastal flood risk in a changing climate along the northern Gulf of Mexico.” 2014 AGU Fall Meeting. San Fransisco, CA, December 15-19, 2014. Abstract: Coastal regions around the world are susceptible to a variety of natural disasters causing extreme inundation. It is anticipated that the vulnerability of coastal cities will increase due to the effects of climate change, and in particular sea level rise (SLR). We have developed a novel framework to construct a physics-based storm surge model that includes projections of coastal floodplain dynamics under climate change scenarios. Numerous experiments were conducted and it was concluded that a number of influencing factors, other than SLR, should be included in future assessments of coastal flooding under climate change; e.g., shoreline changes, barrier island morphology, salt marsh migration, and population dynamics. These factors can significantly affect the path, pattern, and magnitude of flooding depths and inundation along the coastline (Bilskie et al., 2014; Passeri et al., 2014). 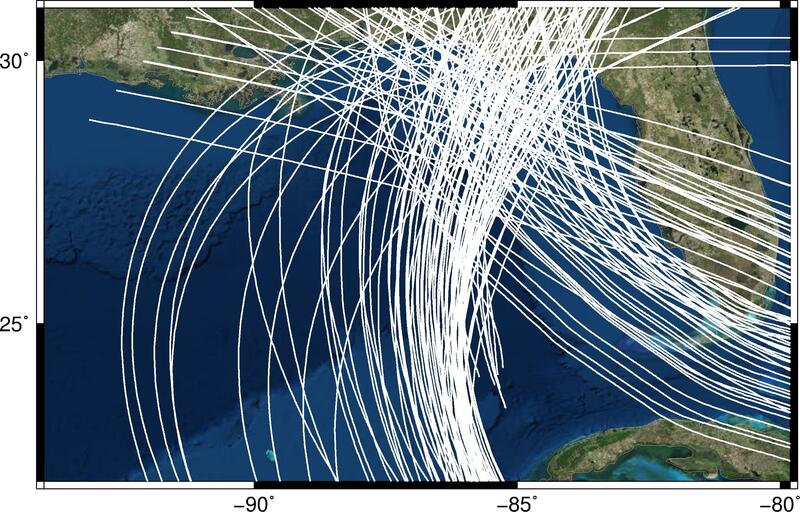 Using these factors, a storm surge model of the northern Gulf of Mexico (NGOM) representing present day conditions is modified to characterize the future outlook of the landscape. This adapted model is then used to assess flood risk in terms of the 100-year floodplain surface under SLR scenarios. 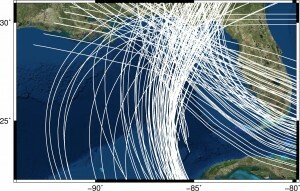 A suite of hundreds of synthetic storms, derived by JPM-OS (Joint Probability Method – Optimum Sampling), are filtered to obtain the storms necessary to represent the statistically determined 100-year floodplain. The NGOM storm surge model is applied to simulate the synthetic storms and determine, for each storm, the flooding surface and depth, for four SLR scenarios for the year 2100 as prescribed by Parris et al. (2012). The collection of results facilitate the estimation of water surface elevation vs. frequency curves across the floodplain and the statistically defined 100-year floodplain is extracted. This novel method to assess coastal flooding under climate change can be performed across any coastal region worldwide, and results provide awareness of regions vulnerable to extreme flooding in the future.